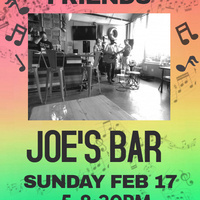 Come join us as we return with a fun evening of music @ Joe's Bar in Boulder Creek. I'll be joined by Jimmy Mason on upright bass + Perry Spinali on fiddle. We have a great set of acoustic roots and blues and some new surprises! All ages, dogs welcome. Hope to see you out there!